Add high performance styling to your pedals with the ROUSH Billet Ford Mustang Pedal Kit. 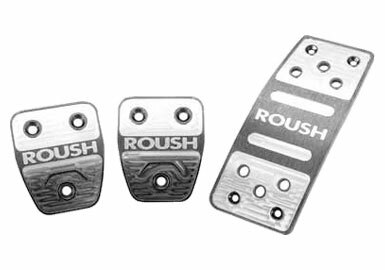 The pedals feature the "ROUSH" logo along with a sleek machined pattern. The kit is made from high-quality aluminum, for its resistance to corrosion, light weight, and appearance The pieces are CNC machined for precise and high quality machining in the U.S.A. This kit fits 2005 - 2010 Ford Mustangs with manual transmissions, and includes pedal covers for the throttle, brake, and clutch. A matching dead pedal kit is available under part #401544. A version of this pedal kit with black accents is also available under part #402827. ROUSH billet pedal kits for 2005-2009 Mustangs with automatic transmissions are available under part #401371 and #402828.